1. Downtown Street Standards: The goal of this effort is to create a palette of urban elements that are beautiful, practical, affordable, sustainable, and appropriate for downtown Burlington from Pearl to Maple (north to south) and from Union to Battery (east to west). 2. 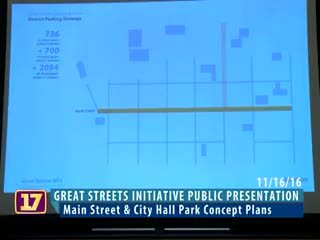 Main Street / St. Paul Street: This initiative will apply those standards to the redesign of six segments of Main Street from Union to Battery and two segments of St. Paul Street from Main to Maple. This effort will culminate in the construction of two key segments of Main Street between Pine and Church. 3. City Hall Park: This project continues the effort to reconstruct one of the oldest and most significant public spaces in Burlington. The work here starts with the already completed schematic design from the four-month public engagement process, Imagine City Hall Park, completed in 2011, and ends with the much anticipated reconstruction.